It’s not uncommon to have an irruption of snowys every four or five years but there was a large flight just two winters ago – 2011-2012. This year’s flight has piqued interest in ornithological circles not only because it follows so closely on the heels of the 2011-2012 irruption but also because (at this point) it is so East Coast centric. Kaufmann points out in his Audubon article that 138 snowys were reported from Newfoundland on Dec. 1, 2013. A quick look at this website http://ebird.org/content/ebird/news/gotsnowies2013/ will show the difference in distribution between the 2011-2012 irruption and this year’s irruption. Kaufmann noted in his piece that most of the Newfoundland owls were reported from Cape Race – the extreme southeastern tip of Newfoundland and, in a rhetorical sense pondered where these birds would show up if they headed south from here over the open ocean. The answer – 600 miles south in Bermuda where at least two and perhaps three snowys have been recorded this year. I believe it’s safe to say that up until now most biologists would attribute these snowy irruptions to a lack of prey in their normal winter range. 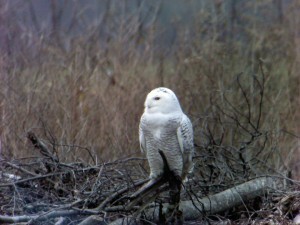 However, lemmings make up the bulk of snowy owls’ diets and 2011-2012 was a banner year for these little rodents. So biologists pondered – what if a banner lemming year resulted in a banner nesting season producing a surplus of snowys resulting in many (especially immatures) being forced further south. Whatever the reason –birds are here. And by here I mean the Carolinas. At least four have been reported from North Carolina and one from South Carolina. For Smoky Mountain News readers the closest snowy is (at this time) in Transylvania County off of Calvert Road near the end of Hooper Lane. 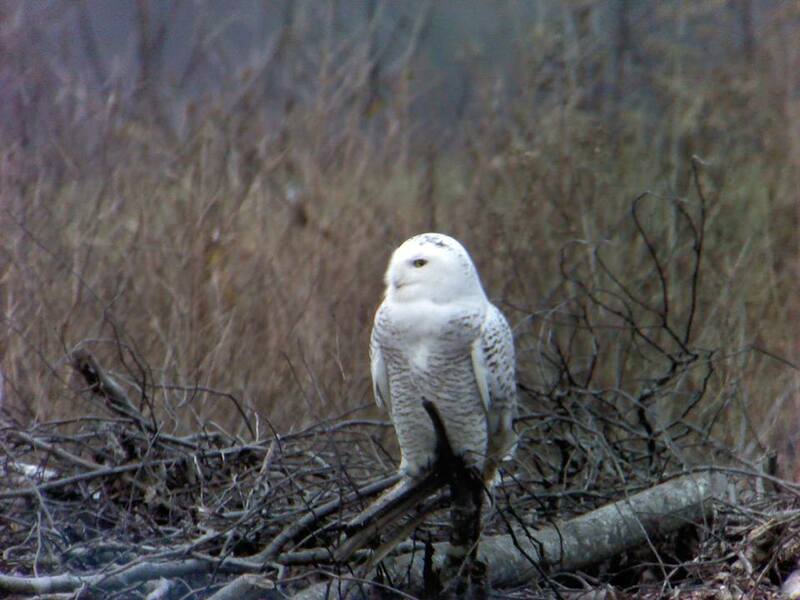 What to look for: snowy owls are chunky – they are the heaviest owls in North America weighing up to four pounds. In appearance they rival great grays with a total length of 23 inches and a wingspan of 52 inches. Adults are nearly pure white while immatures (much more common during irruptions) are flecked with dark markings on the back, however the face, even in immatures is totally white. Kaufmann and others encourage caution and consideration if you’re thinking of chasing snowys. The majority of birds will be immatures and they are inexperienced hunters. They will likely already be stressed from long flights and the search for sustenance. Snowys and other arctic species like gyrfalcons are particularly susceptible to aspergillosis – a fungal respiratory infection – and stressed or weak birds are even more susceptible. The fungus, Aspergillius fumigates, is basically absent from the arctic so these birds have no immune defenses. The healthier they are (less stress) the easier it is for them to fight off the infection. If you’re thinking of trying for one of these magnificent birds please take a spotting scope or go with someone who has a scope so you can give the creature plenty of space.